Poroshenko Mimicks Stories About Putin In Fierce Attempt To Get Upper Hand In Presidential Race 5 out of 5 based on 2 ratings. 2 user reviews. 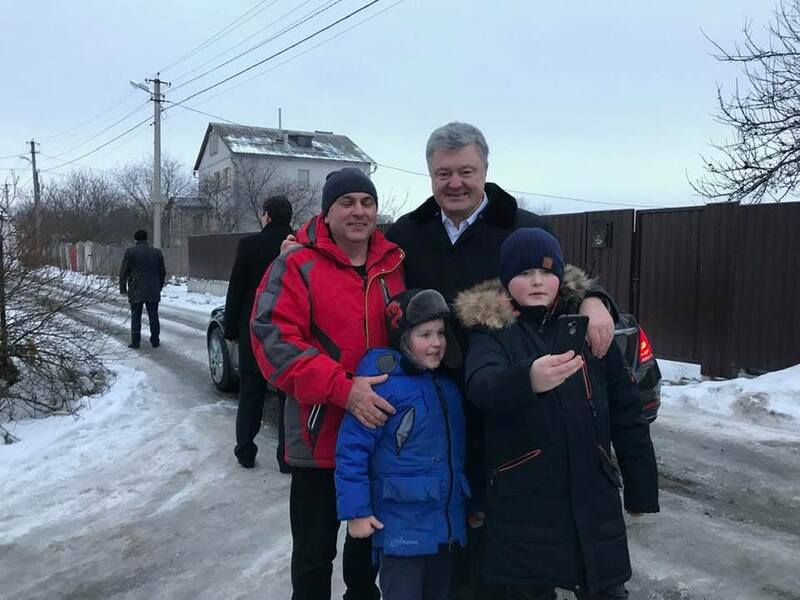 On February 11th, Ukrainian President Petro Poroshenko proved himself a gallant and sensitive leader, when he came out of his car to console a crying little boy. Iryna Gerashchenko is currently the First Deputy Chairman of the Verkhovna Rada, also serving as President’s Humanitarian Envoy at the Minsk peace talks regarding the War in Donbass. Then a few hours later another post followed, showing the selfie with the child and Poroshenko. “Meanwhile, our valiant Facebook is being harassed by both adults and children, who cannot allow us to say a good word regarding the President. Now, after Adi Rogovtsevo and Podereviansky, the victim of harassment is a little boy who dreamed of a selfie with the president. He dared to take a photo and gladly put it on Facebook. And I then dared to write a post not about politics, but about a boy and a selfie. Come on, come on. P.S. President visited a neighboring house, of the known director of “Кіборгів”. The neighbor boy was waiting until he got to do the selfie. A wonderful and cute story. Not about politics. The story would have ended there and then, but one of the individuals who were “harassing” the boy’s selfie made an interesting point. Almost exactly a month earlier, on January 8th, Russian media published a story about Russian President Vladimir Putin. According to it, while leaving the Peter and Paul Fortress in St. Petersburg, Putin got out of his car, stopping the motorcade. He did that simply to console a little girl and to take a photo with her. The story is as follows: the little girl burst into tears right outside of the motorcade, because she saw that Putin had already entered the car and the motorcade was about to leave. According to the reports, she was upset because she had not had the chance to take a photo with the President. “Don’t cry, why are you crying?” Putin asked. After several photographs, the president returned to the car. Of course, naturally things like this happen and it is possible that both Poroshenko and Putin’s stories are true, or maybe they are both fake. Or maybe Poroshenko’s staff just copied the story for PR purposes. If the reality of the situation is that Poroshenko’s staff did, in fact, copied the story about Putin. The question stands: Why does the Ukrainian President mimick a person who he constantly accuses of being an aggressor? No, serious, I actually broke-down and cried after watching this video. Sorry, I thought that you were talking about Poroshenko. Five years on, Ukraine has not benefited from Washington and her envoys having picked their politicians or the IMF running their finances. They also seem to be missing out on what shall be (and become) one of the largest free trade areas around. With the kid Putin stopped for, you can see the happiness and joy, in the one Porky stopped for, he is bored to death. I mean why there are no other candidates not appointed by US embassy ? Because after the coup hunta is supressing (including phisically, using openly nazi gangs) any alternative point of view. Donbas didn’t accept hunta and military power was used against them. Yes, with vilence, most systematically in 2014 esp., also with outlawing of KPU (with about 13% support nationally in 2012, a bit more than ‘Freedom Party/Social Nationalists”). Most recently, in case of party “For Life”, also with arrest of members. This party (backed I suspect by Kernes, after the name Rubinovych also associated with party, this a group of pro-Russian jews in the leadership) seems to be organized out of Kharkov. Gang violence (low-grade Neo-nazis) in UA is of course uniformly applied to any genuine opposition, and can range from true Orthodox churches (recent events in Ternipol with the fake church trying to grab churches by force with such gangs), to media outlets (esp. INTER-KIev, which broadcast the RU World Cup to record audiences in Ukraine) to ANY prominent citizen, e.g., the case of Anna Gubarev head of the UA Cancer Institute of Kiev whose views were too pro-RU, forced to resign her place. Use of gangs coordinated mostly through Parity and I think a few others (Lyashko, maybe Avakov himself who is supposed to suppress these gangs in the first instance, obvious conflicts of interest of course). Well the Americans try to make everywhere like America, so it’s natural they would install the same sort of fake democracy. They finally have (((Freedom)))………….to be ruled by Jews. Porky is a paedo so for him to come out of the motorcade to “console” a young boy… well, you know what I mean!